Welcome to the future. On planet Earth, high-tech buildings create an imposing cityscape as air transports zip back and forth carrying scientists and policy makers to Earth's most important building, the headquarters of Galaxy Garrison. This towering structure is the nervecenter for the all-important federation known as the Galaxy Alliance, a coalition of good planets and star systems that works for freedom and peace in the universe. Unfortunately, many of these planets have become overcrowded, creating serious inner and inter-planetary problems. The First Voltron - the legendary super robot of the far universe composed of 5 robot lions - has long been the key to the Alliance's defense system in that region of the universe. However, realizing that their new expedition would be journeying to space sectors far beyond the reach of even the mighty Voltron - the Alliance developed a new Voltron. When broken into its component parts, the new Voltron consisted of 15 exploration vehicles specially designed for planetary investigation. Though these vehicles were very efficient at their designated tasks, they hardly appeared to be a formidable adversary. It is for this reason that when the mighty Drule Attack Ships swooped down upon them, their Evil Commanders anticipated little resistance. Imagine their surprise when these 15 humble Exploration Vehicles flew together and suddenly transformed into an awesome super-robot: Voltron, Defender of the Universe! Piloted by its dashing captain, Jeff, the mighty Voltron swiftly unleashed its incredible power, defeating the numerically superior Drule Forces, and filling the air with its resounding battle cry: "Let's go Voltron Force!" The surprised Drules headed quickly for home to lick their wounds - and plot their revenge. The above description came from The Official Voltron 3D Web Site, and was edited by yours truly (contact me). The Vehicle Voltron team is comprised of 15 Vehicles broken into three separate teams, the Air Team (consisting of Jeff, Rocky, Chip, Wolo, and Ginger), the Land team (Cliff, Marvin, Hutch, Murdoch, and Sinda), and the Sea Team (Cric, Shannon, Zandee, Tagor, and Lisa). Admiral Newley was in command of the force, and second to him was Commander Hawkins. Their main enemy was the Drule Empire attack fleet, which was a very nasty enemy indeed. Vehicle Voltron was never as popular as Lion Voltron, yet it still has many loyal fans. 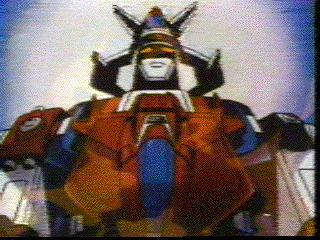 There was even a one hour special that was made, titled "Fleet of Doom", in which the Vehicle Force Voltron teamed up with the Lion Force Voltron. The above description came from Nicole, and was edited by yours truly (contact me).